Citation Information: J Clin Invest. 2011;121(3):941-955. https://doi.org/10.1172/JCI43584. Allergic asthma is characterized by airway hyperresponsiveness, inflammation, and a cellular infiltrate dominated by eosinophils. Numerous epidemiological studies have related the exacerbation of allergic asthma with an increase in ambient inhalable particulate matter from air pollutants. This is because inhalable particles efficiently deliver airborne allergens deep into the airways, where they can aggravate allergic asthma symptoms. However, the cellular mechanisms by which inhalable particulate allergens (pAgs) potentiate asthmatic symptoms remain unknown, in part because most in vivo and in vitro studies exploring the pathogenesis of allergic asthma use soluble allergens (sAgs). Using a mouse model of allergic asthma, we found that, compared with their sAg counterparts, pAgs triggered markedly heightened pulmonary eosinophilia in allergen-sensitized mice. 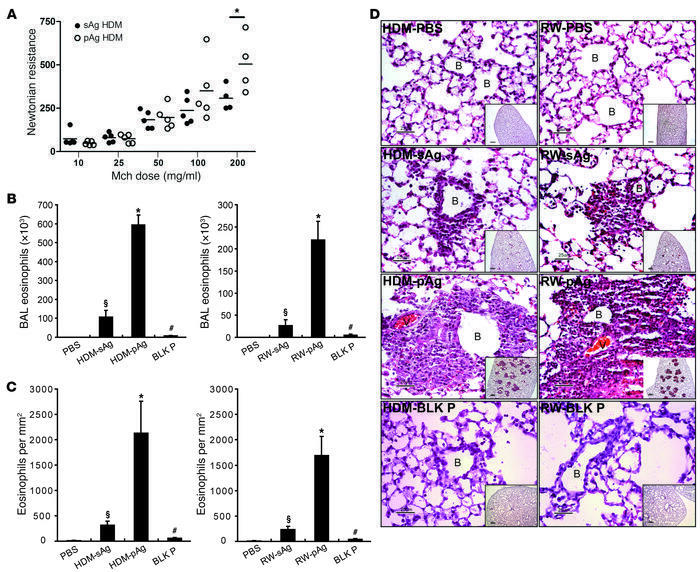 Mast cells (MCs) were implicated in this divergent response, as the differences in airway inflammatory responses provoked by the physical nature of the allergens were attenuated in MC-deficient mice. The pAgs were found to mediate MC-dependent responses by enhancing retention of pAg/IgE/FcεRI complexes within lipid raft–enriched, CD63+ endocytic compartments, which prolonged IgE/FcεRI-initiated signaling and resulted in heightened cytokine responses. These results reveal how the physical attributes of allergens can co-opt MC endocytic circuitry and signaling responses to aggravate pathological responses of allergic asthma in mice. pAgs induce heightened airway allergic responses compared with sAgs. (A) House dust mite–sensitized mice were challenged with HDM in sAg or pAg form. AHR was measured 24 hours after challenge. (B–C) Allergen-sensitized mice were challenged with HDM or RW in sAg or pAg form, saline or unconjugated particles, 48 hours after challenge. (B) BAL eosinophil influx and (C) lung histology were analyzed. For panels B–C, n = 5. *P < 0.05, pAg versus sAg; §P < 0.01, sAg versus PBS; #P < 0.01, pAg versus unconjugated particles. (D) H&E-stained lung tissues. B, small bronchioles; V, vasculature. Insets show larger views of inflammation sites. Scale bars: 25 μm; 200 μm (insets). Each photomicrograph is representative of 4 mice.